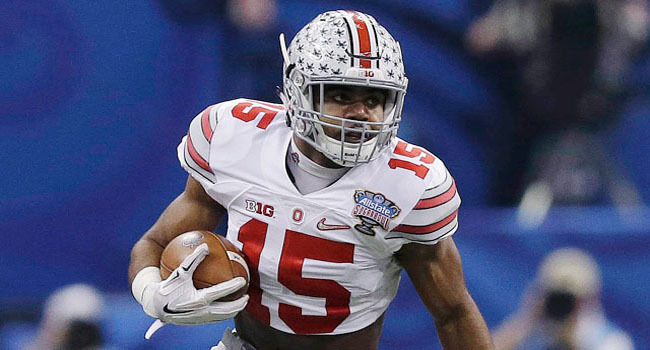 Ezekiel Elliott's Heisman chances could depend on who is playing quarterback in front of him. The most recent Heisman Trophy odds for 2015 are some of the more interesting I can recall in recent years. I say this because among the guys I’ve listed, courtesy our friends at Bovada, four of them hail from Ohio State. It’s not uncommon at all to see two guys from a school among the top favorites but four? That’s pretty impressive. I also feel that could be a detriment as well and I’ll get into that as I break down the list. The biggest thing in Elliott’s way is the fact that regardless of who it is at quarterback for the Buckeyes, that guy will take plenty of attention away from him. That said, it doesn’t mean he can’t have a big year and still win the trophy. Both of these SEC players should garner plenty of attention as often as they’ll be on television. Prescott will benefit from having the ball in his hands more often than Fournette but don’t count out this LSU Tiger. He will slide into the top running back spot for Les Miles and he returns kicks as well. 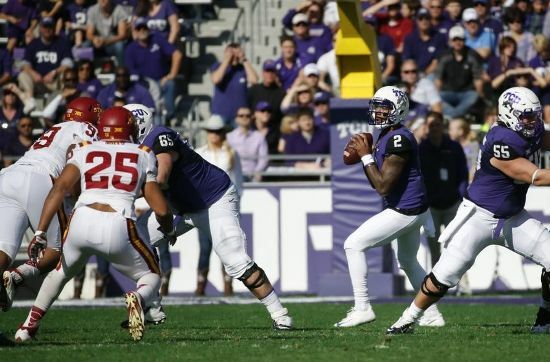 Boykin led the team I thought should have been in the College Football Playoff ahead of Ohio State this past season and he gets the benefit of having nine other offensive starters back with him. Of these three guys, you have to like Chubb’s chances the best. With Todd Gurley in the NFL, he will get the heavy share of the workload in Athens in 2015. Kessler has a shot simply because he plays at USC, but his numbers will need to be exceptional. 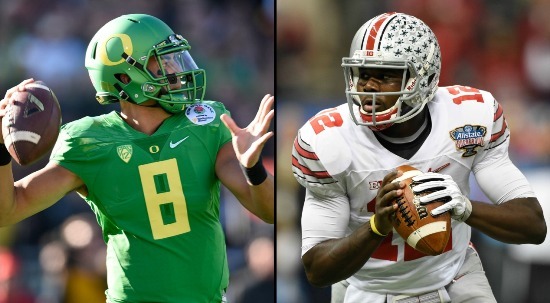 Cardale Jones could be a Heisman front-runner or the second QB off the bench in Columbus. Jones is obviously an interesting bet here having started just three career games yet two of them were for a conference title and a national title. Even if he gets the nod to open the season at QB, who is to say he doesn’t share time with either Miller or Barrett? Perine burst onto the scene with his record-setting performance late last fall. Will he pick up where he left off? I’ve read where there is some speculation that Johnson could actually run Gus Malzahn’s offense better than Nick Marshall did. If he does, then by all means he’ll be in contention. Barrett will be falling under the same situation as Jones and Miller at Ohio State. Who starts and who gets the playing time? We know what Miller can do but will he be in the scarlet and gray when he does it? Cook will more than likely have good efficiency numbers but he’ll probably lack the gaudy numbers usually needed. Watson offers the ability to both run and pass but I’m not sure his consistency will be there all season. Freeman’s biggest issue will be the guy in front of him. 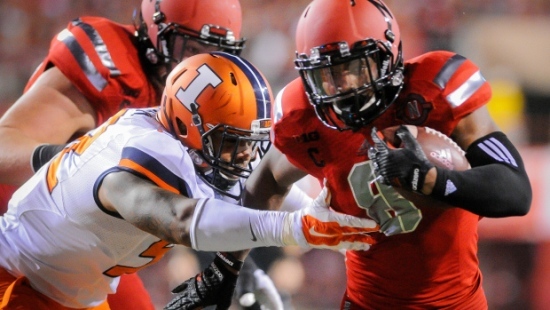 If Marcus Mariota’s replacement is solid, then Freeman’s numbers could be significant. Sonny Dykes’ offense can be down-right explosive and Goff could benefit. The linebacker won’t win it but if he has some big impacts in early games and maintains that consistency he could get a trip to New York. 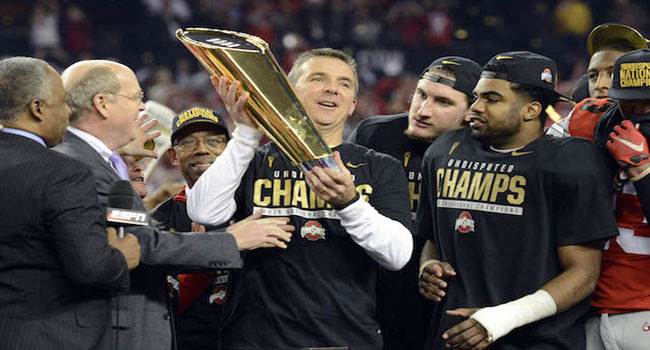 Can Urban Meyer and the Buckeyes repeat as champions? The confetti from Monday night’s College Football Championship Game hasn’t even fallen to the ground yet and already we are looking ahead to who the tops teams in college football will for the 2015 season. Below, you will find the latest odds on the teams favored as well as a reason why I think they could win the title and a reason why I think couldn’t. Ohio State 5/1 -Why? Because regardless of who starts at QB they will have a solid playmaker. Why Not? Hangover. Will the hunger be there for another title run? TCU 15/2 -Why? They have 10 starters back on a prolific offense including their QB. Why Not? They are clearly in the crosshairs now of every opponent. Alabama 9/1 – Why? It’s Nick Saban and the cupboard is far from bare. Why Not? 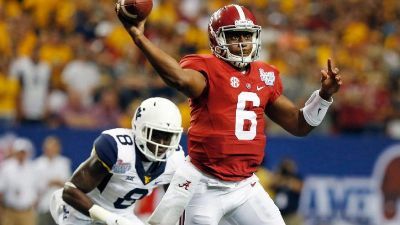 Who steps in at QB to replace Blake Sims? Baylor 14/1 – Why? The Bears bring a lot of guys back and Art Briles has proven he can flat-out coach. Why Not? Bryce Petty is off to the NFL and a step down is only natural to project. Auburn 18/1 – Why? The addition of Will Muschamp as defensive coordinator will bring added stock to the defense. Why Not? 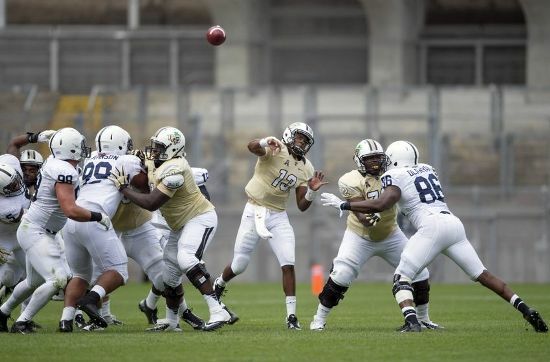 Nick Marshall moves on and can his replacement be as good at QB? Oregon 16/1 – Why? Why Not? New QB and trips to East Lansing, Seattle, Tempe and Stanford await. Michigan State 16/1 – Why? Why Not? Home date with Oregon plus trips to Ann Arbor, Lincoln and Columbus. USC 18/1 – Why? The Trojans should have more depth this season and QB Cody Kessler returns. Why Not? Trips to Tempe, South Bend and Eugene will not be easy. LSU 18/1 – Why? Les Miles returns a lot of guys who will have valuable experience and provide depth. Why Not? Simply put, it’s quarterback play. It has to be better. 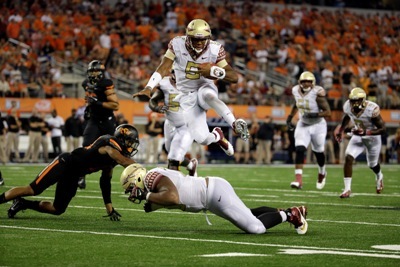 Florida State 20/1 – Why? It’s the ACC and the Seminoles will reload. Why Not? The loss of Jameis Winston and Rashard Greene may be too much to replace. Notre Dame 20/1 – Why? The Irish have a lot of guys back and will ride the wave of a bowl win. Why Not? The schedule is daunting with Texas, Georgia Tech, and USC at home and road games at Clemson and Stanford. Oklahoma 20/1 – Why? Bob Stoops always has good recruiting classes so the cupboard is full. Why Not? 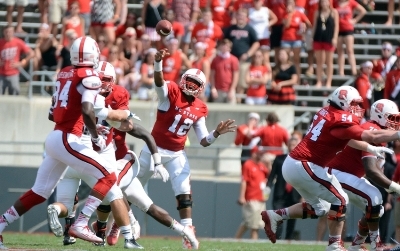 Will the QB play improve and can Stoops shake off a couple of regular seasons? Clemson 25/1 – Why? This could finally be the year the Tigers get past the Seminoles and their huge bowl win provides great momentum. Why Not? Clemson always seems to slip up where it shouldn’t. Can they avoid that? Georgia 25/1 – Why? The SEC East is still struggling and can be had by the Bulldogs who have many players back. Why Not? It’s Mark Richt! He hasn’t gotten over the hump to this point so why would I expect any different? Georgia Tech 50/1 – The defense has improved and the offense is a royal pain in the rear to prepare for and defend. Penn State 100/1 – James Franklin has a very good QB returning and his recruiting class is among the top in the country. Marcus Mariota's legs may be more important than his arms tonight. You’ve probably heard this little trivia tidbit by now but in case you haven’t here it is… Following the first-ever NCAA Basketball Tournament in 1939, the two teams that met for the title were Oregon and Ohio State. The Ducks would claim their one and only national championship in men’s basketball. Now, these same two universities meet in the first-ever college football playoff title game and again, the Ducks enter having won zero national championships in football. Both teams enter at 13-1 and both won their respective conference titles. Each school offers intriguing storylines as the game kicks off tonight. Who do I like and why? Read on. 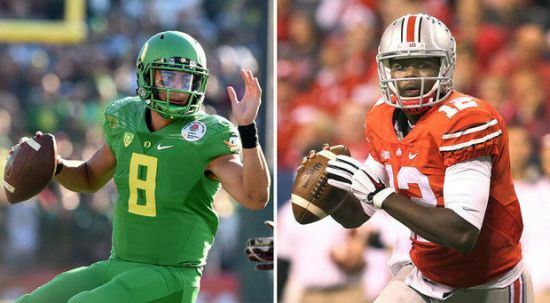 The Ducks will look to frustrate Cardale Jones early tonight in Dallas. Why Ohio State Wins: As good as Oregon Head Coach Mark Helfrich has been, Urban Meyer is a master game-planner who rarely is out-prepared by his opponent. Meyer’s experience heading into this game is significant as well and should be an advantage to the Buckeyes. The defensive line for OSU has been dominant all season and eventually overwhelmed the Alabama offensive line. The Oregon offensive line is very good and is more aggressive than they are given credit for so this should be an excellent match-up. I think the Buckeyes defensively have recognized the fact they will give up yards to Oregon but can they limit the Ducks in the red zone where Oregon has had some struggles? I think the Buckeyes can also bank on the fact that they aren’t going to turn the ball over as many times as Florida State did and that’s important for their confidence. 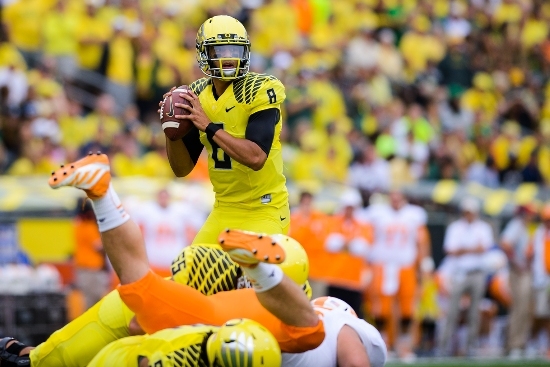 Why Oregon Wins: There is going to be no secret as to what the Ducks are going to do. They will go at a high rate of speed and they will not relent. If they can find some success early running the football against a good OSU defense then that will make Marcus Mariota all the more dangerous. The loss of wide receiver Darren Carrington due to suspension is going to hurt a lot but if the Ducks can find someone to step up that isn’t necessarily expected to then the Ducks will be fine. That’s a tall order however and I’m worried about this situation which is why I think they look to the ground game even more often. Defensively, the Ducks must stop the run and force the game into the hands of Cardale Jones. Alabama was unable to do that and what was even worse is that the Tide weren’t able to contain Jones when he ran either. If Oregon can force Jones into some early mistakes and force him to play from behind then things can swing in their favor dramatically. Trends: Ohio State is 5-0 straight up in their last five games… Oregon is 5-0 SU in their last five games… The total has gone OVER in 12 of Ohio State’s last 13 games… The only common opponent for each team is Michigan State and both trailed by at least a touchdown before coming back to win by double digits. The Pick: I was liking the Buckeyes all week but now I like them even more with Carrington out for Oregon. Don’t be surprised to see a defensive game for most of the first half before the offenses settle in but either way I love Ohio State and the UNDER. 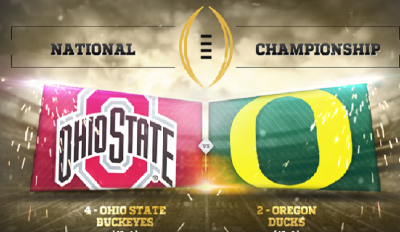 The college football national championship game is just one week away. Within just minutes of Ohio State’s stunning upset of 42-35 over Alabama last Thursday in the Sugar Bowl, sportsbooks everywhere, including Bovada and sportsbook.com posted the Oregon Ducks as 7-point chalk to win the national championship over the Buckeyes. 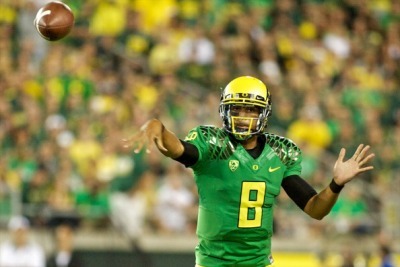 The Ducks thrashed the Florida State Seminoles 59-20 on Thursday in the Rose Bowl. 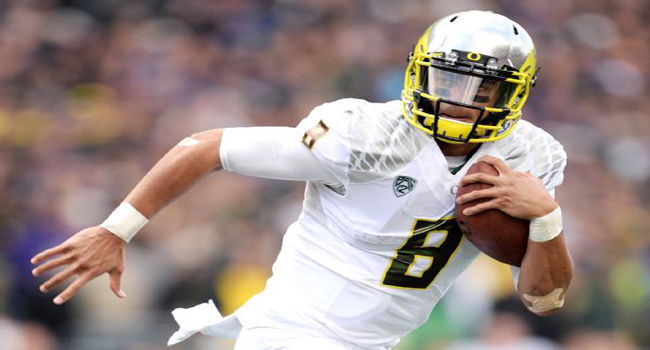 In doing so, Oregon made a big impression on the football world and on odds makers. A big question that odds makers must ask is which team earned more favor of the public with its victory. Remember, it is not about what team the books believe will win, rather it is all about which of the two will be getting the two-way action. The Buckeyes finally beat a team from the SEC during a bowl game, as prior to the Alabama win, Ohio State was 0-9 SU. Their head coach, Urban Meyer has won two national championships. However, the team still must rely on a third string quarterback in Cardale Jones. He has started just two games all season, but they were the two most important of the entire season. Oregon ended Florida State’s winning streak at 29 and their reign as national champions. 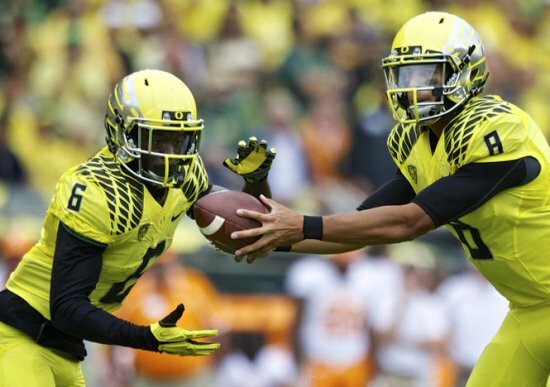 The offense for Oregon is something special, as they have speed in nearly every position. The Ducks are 9-0 SU and ATS in their past 9 games overall since their one loss of the season to Arizona. Over that streak, the Ducks are winning by an average margin of 27 points. Both underdogs, in the two games on New Year’s Day, were bet heavily by the public and sharp money. However, favorites in games that are high profile usually get more support. The futures for Ohio State represent a huge risk for sportsbooks especially those that offered the Buckeyes with odds of 50 to 1 in the preseason after Braxton Miller was injured, according to topbet and betonline. Bettors were all over that figure and eventually the number was pushed down to 12 to 1 before the Buckeyes loss to Virginia Tech on September 6. Odds makers quickly bumped the Buckeyes back up as high as 40 to 1, but that slowly started to fall after every week. Ohio State is now sitting at +240 on the money line as an outright winner, while Oregon is currently -280. Oregon’s odds were as high as 20 to 1 after losing to Arizona. It was not all that long ago when the talk was how many teams from the SEC West would play in the inaugural College Football Playoff, with the Big 10 and Pac-12 receiving little respect. The last laugh this season goes to the Big 10 and Pac-12, as they are the only two left standing. Props aside, the college football lineup for New Year’s Day will be on a par with the Super Bowl says bookmakers. Both the Sugar and Rose Bowl are receiving two-way action, as the games are now just 24 hours away. If the total betting handle is any indication and it certainly is, college football’s decision to put its two semifinal games for the national championship on New Year’s was the correct one. A great deal of action has been written on the two games leading up to the kick offs and much more is expected over the next 24 hours, according to Bovada and betonline. The two big games, along with three others on the day, will make the day the biggest New Year’s Day lineup ever for college football, according to topbet and sportsbook.com. In fact, eliminating the props that are offered that are very popular with betting on the Super Bowl, the lineup for New Year’s Day will be one that is comparable to a Super Bowl. One bookmaker said that when taking into consideration straight bets, totals, sides, teasers and parlays, January 1 will be as much as the Super Bowl. However, almost 50% of the total money bet on a Super Bowl is for prop bets, and excitement around individual college players is not as high as it is for the NFL. The betting action is split evenly thus far between favorites and underdogs in the two College Football Playoff semifinal games. Both games are very popular with bettors and both teams in each game are getting their share of support by the public at the betting window. Both playoff games on Thursday are sitting with a spread of 9 points. In the Alabama vs. Ohio State matchup, the Crimson Tide has gone up to 9.5 points but has pulled back to 9. Oregon in its matchup against Florida State started at -8 and was bet up to -9.5 but has since retreated to -9 as well. A number of bookmakers said that the favorites would need to win for them to do well since a great deal of money has been placed on the two dogs in those two games. The money line is the popular bet since diehard supporters of their college team only believe their team will win outright and often do not take the points route, but just the money line. One bookmaker said he would need Oregon to win both the points and money line and Ohio State to win the points and Alabama to cover the spread. The betting frenzy will continue right up to kickoff on Thursday. Saturday has five college football bowl games on its lineup for bettors to take a shot at one day before the last week of the NFL regular season. There have been a number of bowl games this past week to bet on but as the bowl season moves on towards the New Year, the games becoming more compelling. On Saturday, the five games have some intriguing matchups including the Independence Bowl featuring Miami taking on South Carolina and the Holiday Bowl with USC playing Nebraska. Here are a few words about each of the five games taking place on Saturday. The lineup of games should give bettors ample choices to choose from. Cincinnati is favored in this bowl by 3 points with the point total sitting on 51. Cincy has the better record. However, the Bearcats have faced weak competition this season. Virginia Tech beat Ohio State this season and the Buckeyes easily beat the Bearcats. The Hokies however have played inconsistently the entire season. The Arizona Sun Devils are favored by 7 points, with the point total sitting on 65. Both teams should be highly motivated to reach win No. 10 for the season in this game. The Sun Devils have a strong offense with talent that likely will go on to play in the NFL. Look for high scoring in this one, with a lean toward Duke and the points. The Miami Hurricanes are favored in this bowl by 3.5 points, with the point total sitting on 61. Both motivation and defense favors the Hurricanes. Miami has a great deal to prove after Louisville blew them out last season in the Russell Athletic Bowl. At the same time, South Carolina has been used to playing in bowl games that are more high profile and that could have a bearing on their overall play. Boston College is favored in this game by 2.5 points with the point total sitting on just 40. Penn State will be highly motivated in this game as they return to play in the postseason since have their ban lifted. BC plays up to its level of competition or down depending up its opponent. The total is low and that could be the best way to go. The Trojans are favored by 7 points with the point total sitting on 62. Nebraska will play under interim coach Barney Cotton. USC has one of the best quarterbacks in the country in Cody Kessler. The spread might by too much for USC to cover. Look for plenty of points to be scored in this one.